Gain a better understanding of the evolution of photography. Discover how Henry Hamilton Bennett became one of the world's greatest landscape photographers. Learn how Wisconsin Dells became a vacation destination. Located in the middle of downtown Wisconsin Dells, H.H. 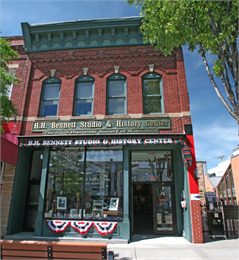 Bennett Studio is the nation's only restored 1875 photography studio. It offers school groups a unique destination for an educational outing. Lunch Many convenient eating establishments are within easy walking distance. Brown bag lunch facilities are available at the studio. To reserve a field trip, call 608-253-3523 or email us. Photographer Henry Hamilton Bennett moved into the current studio in Wisconsin Dells in 1875. It has been in continuous operation ever since and is believed to be the oldest operating photography studio in the United States. Bennett's family ran the business until 1998 when they donated the property to the Wisconsin Historical Society. The studio houses many of Bennett's original photographs, glass plate negatives, photography inventions, cameras and equipment. To get directions, parking maps and more see Location, Directions, Transporation to H.H. Bennett. The bus loading zone is direclty in front of the main entrance. Free on-street parking is available behind the Studio and in city lots. Learn more about H.H. Bennett field trips.